iQiyi is trading down more than 8% on Friday, and 23% from its June high. The sell-off comes amid a lack of any headlines, and looks to be technical. Shares had more than doubled over the past month. 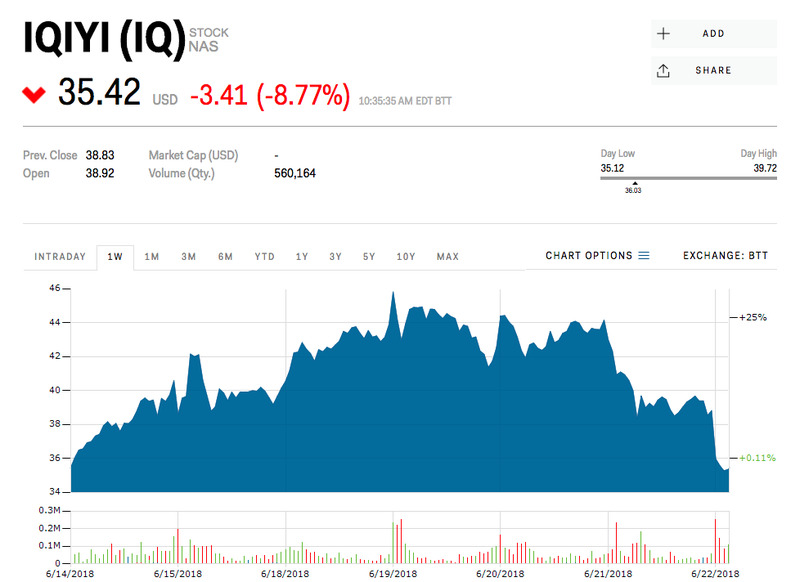 iQiyi, often referred to as the Netflix of China, is getting hit hard for a second straight session. Shares are trading down 8.77% at $US35.42 early Friday. Two days of heavy selling have erased more than $US6 billion of market cap, and sent shares down 23% from their June 19 record high of $US46.23 a share. The recent weakness comes amid an absence of headlines, and appears to be related to some technical weakness. Early Thursday, selling pushed prices below the trendline that was in place from the rally that ocurred from May 21 to June 19. Over that time, shares more than doubled in value. iQiyi has seen a cult following among millennial investors in recent weeks. Data from the free trading app Robinhood, which skews towards younger investors, shows iQiyi has moved to 24th place on the most-owned list among users. It wasn’t even in the top 100 a month ago, the data showed. Share of iQiyi are up 98% since their March 29 initial public offering.